A determined Yorkshire lad, John Benson-Smith has come along way over the last few years. After training in France with the famous Louis Outhier John drew inspiration from working with other well-known chefs including Michael Quin, Peter Chandler and Nico Ladenis. Known as Super Chef at Manchester's celebrity filled Victoria & Albert Hotel, where he spent five years, John produced food in his signature style of imagination, flair and infamous food descriptions. His efforts were recognised - he was instrumental in putting Manchester on the important food map and achieved high accolades. 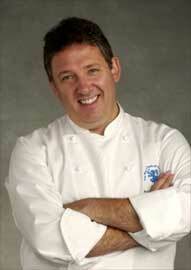 In January 1997 John moved back to his native Yorkshire as Chef / Director of a new project - Hazlewood Castle. Nine months later the Castle opened its doors, having been totally transformed and restored to its former glory. Guests at Hazlewood include many famous faces, including royalty. Today Hazlewood Castle is one of the finest hotels / business destinations in the country. John is currently working with Loyd Grossman (commissioned by the Government) to advise the National Health Service on the Better Hospital Food Initiative and he is passionate about implementing change to improve hospital food. Former BBC Masterchef Judge and Northern Chef of the Year, John also acts as a chef consultant to major food manufacturers and producers. He successfully endorses and promotes a range of products that are appropriate to his lifestyle and his expertise. His inexhaustible energy and genuine love of the hospitality industry make him a valuable agent to many companies. John assists contract caterers and has carried out work with retail bakeries. Manchester City Football Club have appointed him as Consultant for their magnificent new stadium (the Commonwealth Games Stadium) and John enjoys writing for various newspapers and magazines. John is a much sought after cookery demonstrator at his own cookery school and throughout the UK, he appears regularly at events such as the BBC's Good Food Show. This biography has been published with the kind permission of Celebrity Chefs UK.